WHY IS DISPERSION MODELLING USEFUL? At Silsoe Odours, we use dispersions modelling when we work closely with a range of business customers involved with the planning of new, or modification of existing, premises where malodours may be produced. 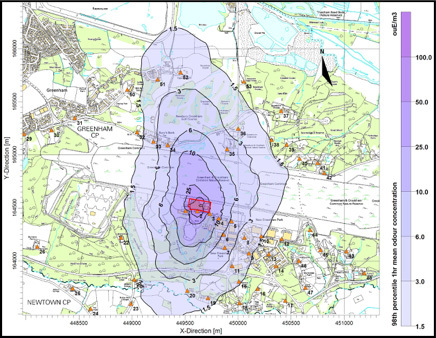 Using data from an odour emission survey, dispersion modelling provides the only method of predicting the potential odour impact of a new or modified premises. Distance between receptor and odour source. Emission characteristics and level of concentration at source. Building downwash causing turbulent wind flows. Dispersion modelling is a process of mathematical modelling, which allows you to understand how the odours your operations may produce are likely to travel and their impact concentration. This can be invaluable in being able to predict the impact your operations could have on the local community. WHAT DO DISPERSION MODELLING RESULTS LOOK LIKE? At Silsoe Odours laboratories we develop our dispersion modelling based on years of experience in understanding how odours travel, at what frequency, and the period of dispersal. The resulting data can help businesses understand how they fit in to their local community and recognise the impact they may have. If you are planning a new facility, or modifying an existing one, Dispersion Modelling could help. Call our team today on 01525 351 396.